I visit Gettysburg a lot and I also write about it a lot. When I make those visits I am always humbled and learn something new. I only wish that most Americans and our leaders of both political parties as well as most media types and pundits could grasp what I experience on each visit to the “hallowed ground” of Gettysburg. Quite honestly I do not think that the vast majority Americans regardless of their party affiliation or ideology understand, appreciate or value in the slightest the sacrifices of the men who fought and in many cases died to preserve the Union at Gettysburg. 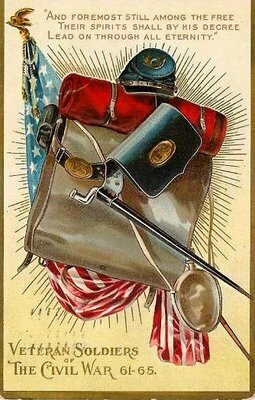 Even among those who do I think that the object of their appreciation are the military aspects of the battle often taken in isolation, not the profound strategic dimensions of what this battle as well as the fall of Vicksburg in the west at the same time had on the war. Nor do I think that they appreciate the massive political, ideological and social effects bought about by those Union victories in ending the war and how those effects redound to us today. This is especially true of the pundits, politicians and preachers, the “Trinity of Evil” as I call them whose shrill voices urge on divisions between our people; including some that call out for violence to maintain their groups social, economic or religious advantages over others. Quite a few even lament the fall of the South and the institution including the washed up rock and roll musician of the political right Ted Nugent who wrote in the Washington Times in July 2012: “I’m beginning to wonder if it would have been best had the South won the Civil War.” More recently when President Trump talked of the moral equivalence of the opposing sides at Charlottesville I was reminded of just how hateful and morally bankrupt such feelings are, I am sure that General Hancock would be appalled that an American President would make that kind of stand. All of that concerns me as an American and a historian; because I realize how dangerous such historical ignorance and visceral propaganda is in the life of any nation. Thus when I go to Gettysburg, or for that matter any other battlefield of our American Civil War the sacrifices of those men and what they fought to maintain are again imprinted on my heart. Thus I appreciate military men who maintain their oath to the nation in times of great conflict not abandoning it to support causes that they know are wrong because the people of their state, or interest group seek to divide that Union. Winfield Scott Hancock was one of those kind of men, as was George Meade, and John Buford, all of whom played key roles in defeating the Confederates at Gettysburg. 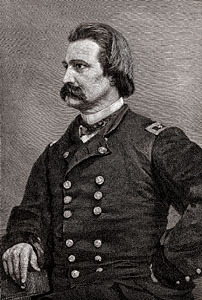 Hancock, who earned the title “Hancock the Superb” was the commander of the Union Second Corps at Gettysburg. Upon the death of John Reynolds early on the first day of battle Hancock was appointed by George Meade as commander of the Federal Left Wing, in effect becoming Meade’s deputy commander for the rest of the battle. He was seriously wounded as Pickett’s Charge came to its bloody end at “the Angle” even as his dear friend Confederate General Lewis Armistead lay mortally wounded a few hundred yards away. Hancock is an interesting character. He was from Pennsylvania but was a Democrat. He was not a Republican like Lincoln. Hancock was not a political ideologue but was since he was a Democrat he was suspect by leaders in the party establishments of both parties; Republicans for being a Democrat, and Democrats for serving under Lincoln. As such he never was given independent command of an Army but remained the beloved commander of the Union Second Corps. After the war Hancock supervised the execution of those convicted of the assassination of Abraham Lincoln. Following that duty he served in various postings in the occupied South and attempted to mitigate some of the actions of those bent on vengeance against African Americans as well as others who tried to exploit the defeated Confederates for political or economic gain. His balanced attempt at justice was not appreciated by many people in the North or the South. In 1880 Hancock ran for President and lost a narrow election to James A. Garfield. After his unsuccessful campaign he returned to the Army and died at the age of 61 in 1886 at his headquarters from complications from diabetes. 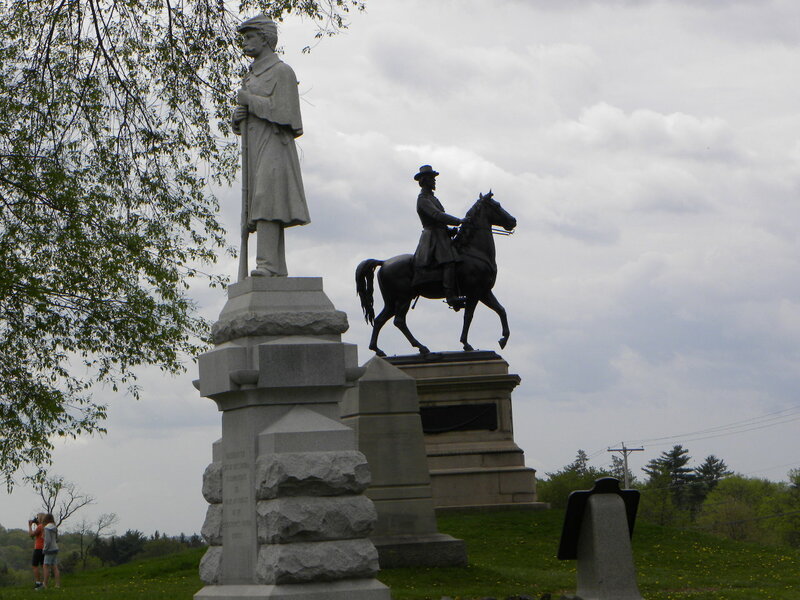 I have stood by the monument to this fine man on East Cemetery Hill at Gettysburg many times. Each time I am struck by the bravery, courage and integrity of that remarkable man. Regardless of party affiliation I wish that we had more leaders like him today. Last night I re-read the Declaration of Independence as I do about this time of year and as I do so I reflect upon the profoundly revolutionary nature of that document. It is not a long read, but quite profound and as I said revolutionary. As I read again I reflected on the beginning of the second sentence of that document. “We hold these truths to be self-evident, that all men are created equal…” This statement is really the heart of the document and something that when penned by Thomas Jefferson and ratified by the Continental Congress in July 1776 overturned the political philosophy of the day. 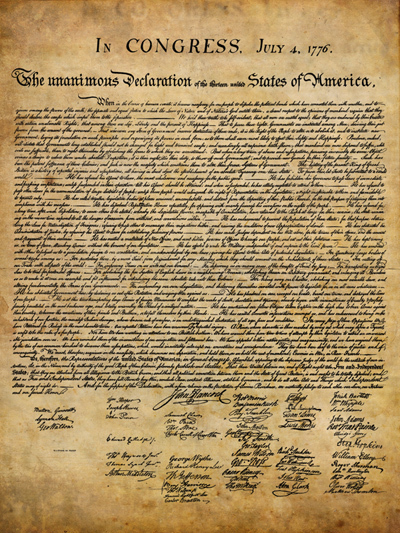 These words, which begin the second sentence of the Declaration of Independence announced something unimaginable to the people around the world, most of which labored under the rule of ensconced monarchies, nobilities and state religions. In the world where they were written a person’s family pedigree, ownership of property or even religious affiliation counted more than anything else. In that world few commoners had any hope of social advancement, no matter what their talent, ability or genius. The words of the Declaration were a clarion call of equality and were revolutionary in their impact, not only in the American colonies but around the world. In the coming years people around the world would look to those words as they sought to free themselves from oppressive governments and systems where the vast majority of people had few rights, and in fact no equality existed. But the liberty and equality stated in the Declaration of Independence did not extend to all in the United States, or in its territories as it expanded westward, and the inequity eventually brought on a great civil war. Eighty-seven years after those words were published the nation was divided, in the midst of a great civil war, a climactic battle having just been fought at Gettysburg. A few months later President Abraham Lincoln penned one of the most insightful and influential documents ever written, the Gettysburg Address. One thing that our founders overlooked was that even while proclaiming equality, they later enshrined that one group of people, African slaves were not equal, in fact they only counted as three fifths of a person. Eventually, many states on their own abolished slavery, but because of the invention of the Cotton Gin slavery became even more fully entrenched in the American South, when an oligarchy of land and slave owners held immense power, where nearly half of the population was enslaved and where even poor whites had few rights and little recourse to justice. Even so it took time for the abolition of slavery to be acknowledged as a major concern by the Federal government, it was not until 1862 after Lee’s failed invasion of Maryland and the Battle of Antietam that Lincoln published the Emancipation Proclamation, and that only applied to Confederate occupied areas. 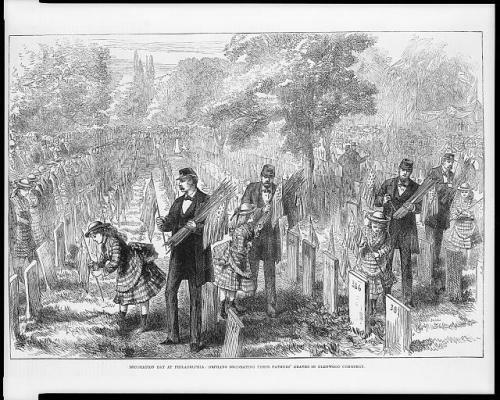 But in 1863 after Gettysburg Lincoln was asked to speak a “few words” at the dedication of the Soldiers’ cemetery. Lincoln’s words focused the issue of the war in relation to those first words of the second sentence of the Declaration of Independence, the understanding that all men are created equal. Unfortunately, the issue of equality has languished in our political debates. Equality is the sister of and the guarantor of the individual liberties enunciated in the Declaration. However because of human nature always more vulnerable to those that would attempt to enshrine their personal liberty over others, or attempt to use the courts and Constitution to deprive others of the rights that they themselves enjoy, or to enshrine their place in society above others. In some cases this is about race, sometimes religion, sometimes about gender and even sexual orientation. Likewise there are those that would try to roll back the rights of others, as those who seek to disenfranchise the poor and minorities, particularly African Americans at the ballot box. I wish all of my readers a happy Independence Day. I also ask that all of us please remember that unless liberty is liberty for all then it is really only liberty for some; those of great economic power and influence; or who happen to be the right race, religion, gender or sexual preference.I don’t believe that such was the intent of Jefferson and those who ratified the Declaration, and I know that it was not the case for Abraham Lincoln, who eighty-seven years later called Americans to embrace a new birth of freedom. As we contemplate the importance of Memorial Day and remember the men and women who gave their lives for this country it is important to remember why we do this. Memorial Day grew out of local observances following the Civil War, a war that claimed the lives of over 620,000 American Soldiers from the Union and the Confederacy. New demographic studies by historians estimate the losses at closer to 750,000. Hundreds of thousands of other people had they lives shattered by the war, killed, wounded, maimed, crippled, shattered in mind and spirit, the country in many places devastated by war’s destruction. Using the 620,000 number that would have meant that 2.5% of the population of the country died in the war. People needed to make sense of the losses. To put this in perspective, if the same number of Americans were to die today in a way the total would be over seven million people. Seven million my friends. War reached into every home in some way, and sadly or perhaps thankfully we have no concept of such losses today. I. The 30th day of May, 1868, is designated for the purpose of strewing with flowers or otherwise decorating the graves of comrades who died in defense of their country during the late rebellion, and whose bodies now lie in almost every city, village, and hamlet church-yard in the land. In this observance no form of ceremony is prescribed, but posts and comrades will in their own way arrange such fitting services and testimonials of respect as circumstances may permit. If our eyes grow dull, other hands slack, and other hearts cold in the solemn trust, ours shall keep it well as long as the light and warmth of life remain to us. Let us, then, at the time appointed gather around their sacred remains and garland the passionless mounds above them with the choicest flowers of spring-time; let us raise above them the dear old flag they saved from dishonor; let us in this solemn presence renew our pledges to aid and assist those whom they have left among us a sacred charge upon a nation’s gratitude, the soldier’s and sailor’s widow and orphan. II. It is the purpose of the Commander-in-Chief to inaugurate this observance with the hope that it will be kept up from year to year, while a survivor of the war remains to honor the memory of his departed comrades. He earnestly desires the public press to lend its friendly aid in bringing to the notice of comrades in all parts of the country in time for simultaneous compliance therewith. III. Department commanders will use efforts to make this order effective. General Logan’s order is remarkable in its frankness and the understanding of the war in the immediate context of its conclusion. In 1868 the day would be observed at 183 cemeteries in 27 States and the following year over 300 cemeteries. Michigan was the first state to make the day a holiday and by 1890 all states in the North had made it so. In the South there were similar observances but the meaning attributed to the events and the sacrifices of the Soldiers of both sides was interpreted quite differently. In the North the Veterans overwhelmingly saw themselves as the saviors of the Union and the liberators of the Slaves. In South it was about the sacrifices of Confederate soldiers in what became known as the “Lost Cause.” But in both regions and all states, the surviving Soldiers, family members and communities honored their dead. 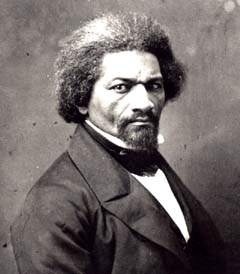 In 1884 Oliver Wendell Holmes Jr. and Frederick Douglass both spoke about the meaning of the sacrifice made by so many. It is important for the country not to forget those who served and the cost of those who have given the last full measure of devotion to duty and those who still carry the scars of war on their bodies and in their minds and spirits. I am one of the latter and I have known too many of the former. Maybe that is why am so distrustful of those who advocate for war but have no skin in the game. I agree with him and pray that those who direct the course of this nation will take the words of General Logan, Oliver Wendell Holmes Jr., Frederick Douglass and Guy Sager to heart before they embark on war, and when they remember those that have served. I am on the way home from Gettysburg with my students after concluding the second day of our Staff Ride. As always it has been a really good experience. We concluded the event by going to the Soldier’s Cemetary, which is located on the western section of Cemetary Hill. It is the place that Abraham Lincoln delivered the Gettysburg address as well as the final resting place of many of the Union soldiers who died during the battle or shortly thereafter from their wounds. Many of these men are unknowns. 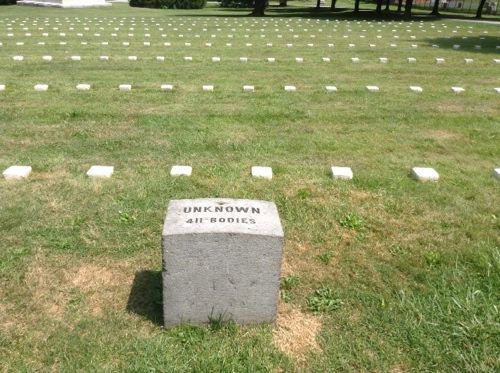 They are buried in sections which simply note how many unknown soldiers are in that section, and each of these graves is marked by a small stone engraved with a number. I strongly believe that all citizens should have to make a pilgrimage to Gettysburg. I do not limit this belief to the military professionals who have to prepare for war and fight it when it breaks out, like the men and women of my class. But I especially believe others need to walk the battlefield and be taught by someone that can put the events of the battle into proper perspective. This includes the politicians and policy makers that get us into wars, the think tank wonks and business leaders who profit from war, and the pundits and preachers who stir up the passions of people to support war, need to walk the battlefield. The same is true today. Too many people, especially those with “no skin in the game” eagerly urge the President to throw U.S. Military power into conflicts that have little chance of being solved by the application of that power. To me it seems like the lives of our military personnel are cheap for many people, especially the politicians, pundits and preachers; but also the war profiteers, while most citizens are apathetic at best, as bumper sticker patriotism is easy. Basically this is because for most people war is remote from their lives. The military is a voluntary organization with comparatively stringent standards required for enlistees. Even at the peak of our Iraq-Afghanistan wartime strength under one percent of the population actually served in the military. So when I hear people yammering about committing troops to places that many citizens, including the politicians, pundits and preachers, cannot even find on a map, with no plan or purpose once we commit ourselves to war, I get spun up. 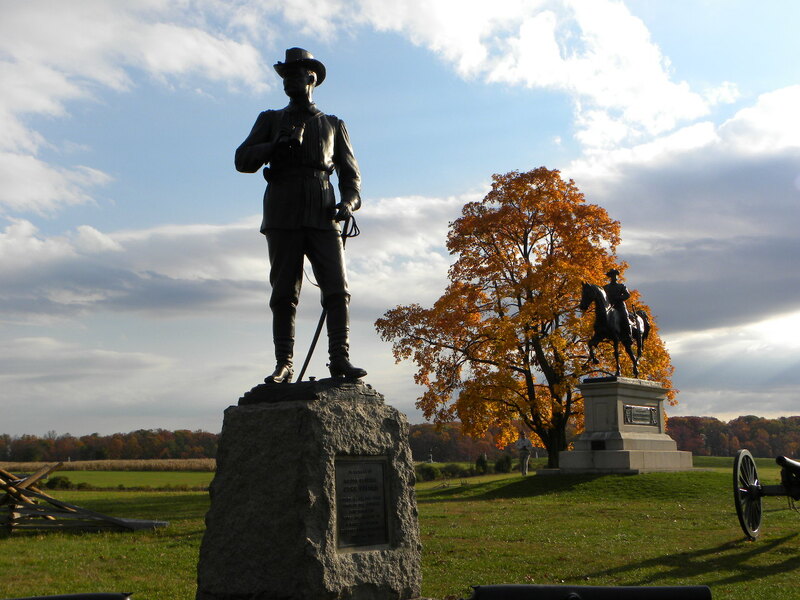 For me Gettysburg, and many other battlefields are powerful reminders of the cost of war. They are also reminders of the grave responsibility of those who take a nation into war or who counsel leaders to go to war, responsibilities that many people seem to take lightly. I think that those with that responsibility, which in a democracy is all of us, need that reminder and most of us don’t get it. Since so few citizens actually serve in the military, I think that everyone should spend two or three days walking that battlefield and learn the lessons as they stand in the elements, exposed to whatever the weather gods can throw at them. People should learn the lessons when they are tired and uncomfortable. This weekend the weather was very similar to what the men than fought at Gettysburg experienced, it was warm and humid, and walking across the field that Pickett’s soldiers advanced, or over the craggy rocks of Little Round Top gave us an appreciation for what those soldiers experienced, without the shooting and death. As I walked the cemetary with my students spent some time talking about the number of casulaties incurred at Gettysburg, because there is a real flesh and blood cost associated with war, it’s not like the movies or a video game. I don’t know about you, but I don’t like it when soldiers die in vain. Last night I re-read the Declaration of Independence. I do this about every time this year. It is not a long read, but quite profound. As I read again I reflected on the beginning of the second sentence of that document. “We hold these truths to be self-evident, that all men are created equal…” When penned by Thomas Jefferson and ratified by the Continental Congress in July 1776 these words, which begin the second sentence of the Declaration of Independence announced something unimaginable to the world, most of which labored under the rule of ensconced monarchies, nobilities and state religions, where your social status and religious affiliation counted more than anything else, places where few commoners had any hope of social advancement, no matter what their talent, ability or genius. They were a clarion call of equality and revolutionary in their impact, not only in the American colonies but around the world. In the coming years people around the world would look to those words as they sought to free themselves from oppressive governments and systems where the vast majority of people had few rights, and in fact no equality existed. Eighty seven years after those words were published the nation was divided, in the midst of a great civil war, a climactic battle having just been fought at Gettysburg. A few months later President Abraham Lincoln penned one of the most insightful and influential documents ever written, the Gettysburg Address. Even so it took time for the abolition of slavery to be acknowledged as a major concern by the Federal government, it was not until 1862 after Lee’s failed invasion of Maryland and the Battle of Antietam that Lincoln published the Emancipation Proclamation, and that only applied to Confederate territories. Have a happy 4th of July and please remember that unless liberty is liberty for all then it is really only liberty for some; those of great economic power and influence; or who happen to be the right race, religion, gender or sexual preference. It was after the great bloodletting known as the American Civil War that Memorial Day, originally known as Decoration Day was established. The first observance was made by the recently freed slaves of Charleston South Carolina who honored the memory of the Union Soldiers who had died at the Washington Racecourse Prison Camp on May 1st 1865. Other celebrations began around the country in May and June of 1866. By 1868 the Commander of the Grand Army of the Republic Union Veterans association General John Logan issued an order directing that the 30th of May 1868 be designated to the memory of the Union Soldiers, Sailors and Marines who had given their lives in the defense of the Union. General Logan’s order is remarkable in its frankness and the understanding of the war in the immediate context of its conclusion. In 1868 the day would be observed at 183 cemeteries in 27 States and the following year over 300 cemeteries. Michigan was the first state to make the day a holiday and by 1890 all states in the North had made it so. In the South there were similar observances but the meaning attributed to the events and the sacrifices of the Soldiers of both sides was interpreted differently. In the North it was about preserving the Union and in the South the interpretation of the Lost Cause. Yet in both regions and all states, the surviving Soldiers, family members and communities honored their dead. This Memorial Day we will honor all that have fallen but in our mind are the few that fight our current wars, wars that unlike that terrible Civil War, the majority of the population does not experience. The order of the Grand Army of the Republic establishing Memorial Day is posted below. I am back home after leading another trip to Gettysburg with a new group of students. Quite honestly I do not think that the vast majority Americans understand, appreciate or value in the slightest the sacrifices of the men who fought and in many cases died to preserve the Union at Gettysburg. Even among those who do I think that the object of their appreciation are the military aspects of the battle often taken in isolation, not the profound strategic dimensions of what this battle as well as the fall of Vicksburg in the west at the same time had on the war. All of that concerns me as an American and a historian; because I realize how dangerous such historical ignorance and visceral propaganda is in the life of any nation. Thus when I go to Gettysburg, or for that matter any other battlefield of our American Civil War the sacrifices of those men and what they fought to maintain is again imprinted on my heart. 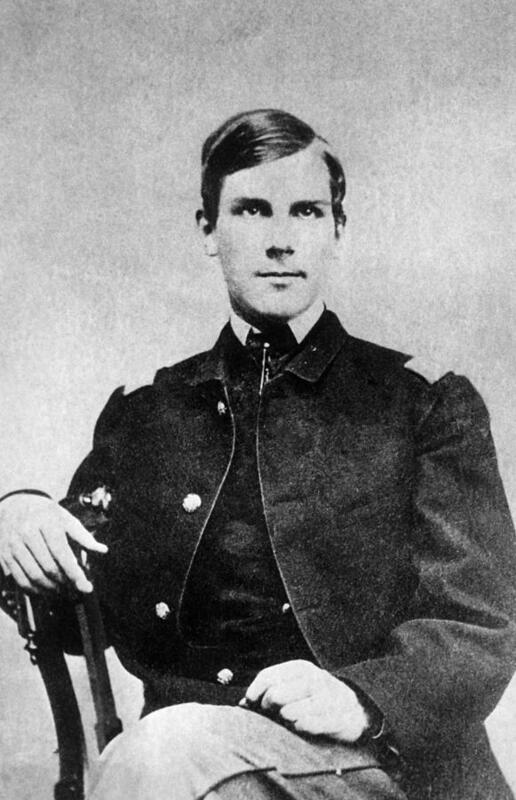 Hancock, who earned the title “Hancock the Superb” was the commander of the Union II Corps at Gettysburg. Upon the death of John Reynolds early on the first day of battle Hancock was appointed by Meade as commander of the Federal Left Wing, in effect becoming Meade’s deputy commander for the rest of the battle. He was seriously wounded as Pickett’s Charge came to its bloody end at “the Angle” and his dear friend Confederate General Lewis Armistead lay mortally wounded a few hundred yards away. Hancock is an interesting character. He was from Pennsylvania but was a Democrat. He was not a Republican like Lincoln. Hancock was not a political ideologue but was since he was a Democrat he was suspect by some in the party establishments of both parties and never was given independent command. 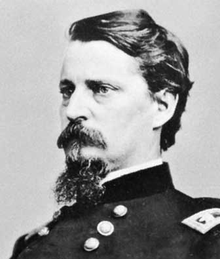 After the war he supervised the execution of those convicted of the assassination of Abraham Lincoln and in various postings in the occupied South attempted to mitigate some of the actions of those bent on vengeance and others who tried to exploit the defeated people of the south for political or economic gain. Hancock ran for President and lost a narrow election in 1880 to James A. Garfield. After that he returned to the Army and died at the age of 61at his headquarters of complications from diabetes. As I stood at the statue that marks Hancock on Cemetery Hill this weekend I again was struck by the bravery, courage and integrity of that remarkable man.